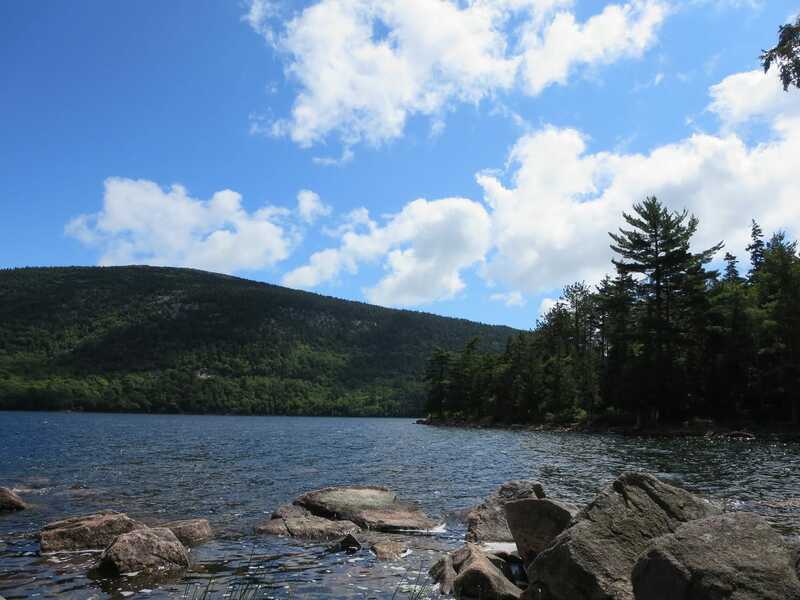 Maine’s Acadia National Park is known for its wide array of natural beauty – crystal clear waters, ocean views from mountain peaks, rolling beaches and more. Jordan Pond fits the bill in more ways than one. The pond is large (187 acres), has a maximum depth of 150 feet and has an incredible visibily of up to 60 feet. North Bubble Mountain and South Bubble Mountain tower over the pond at its north end, while both the east and west ends are ridges that make the pond feel like a sunken paradise. 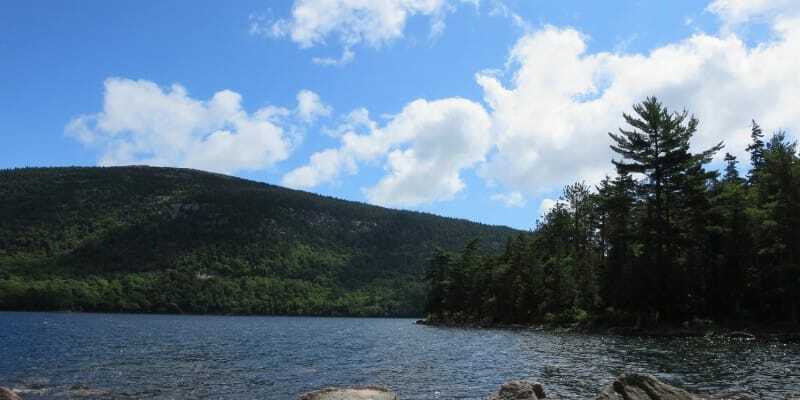 The pond has about 3.5 miles of shoreline, which also happens to be the approximate length of the loop trail that hikers use year-round. Starting at the southern end of the pond – with North and South Bubble Mountains straight ahead in the distance – hikers can choose to start the loop either to the left (west end) or the right (east end). On our hike in August 2014, we chose to go left and travel the loop from west to east. 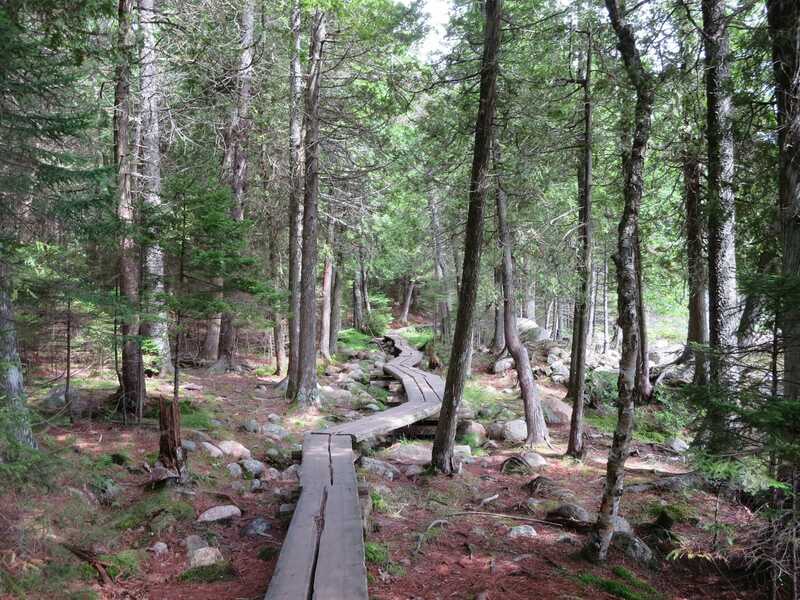 The trail on the west side of the pond was mostly constructed of wooden planks strewn across varying dry and marshy land. 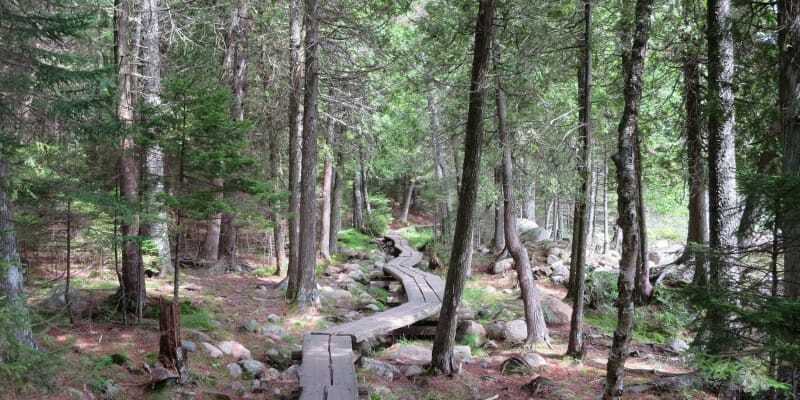 The planked trail provided relatively easy travel, with the exception of a few logjams that ocurred with hikers coming from the opposite direction. Once reaching the north end of the pond, some quick scrambling through rocky terrain dropped us off at a perfect rest spot looking back at where we started. After a short break, we passed by the small beach and crossed the short wooden bridge to reach the east side of the loop. The east side of the loop is much more level and manicured (no wooden planks) than the west side and proved to be the least exciting stretch of the hike. Arriving back at the south end of the pond with cameras full of varying digital versions of Jordan Pond, we now finally started to understand Acadia in all of its calming magnificence. 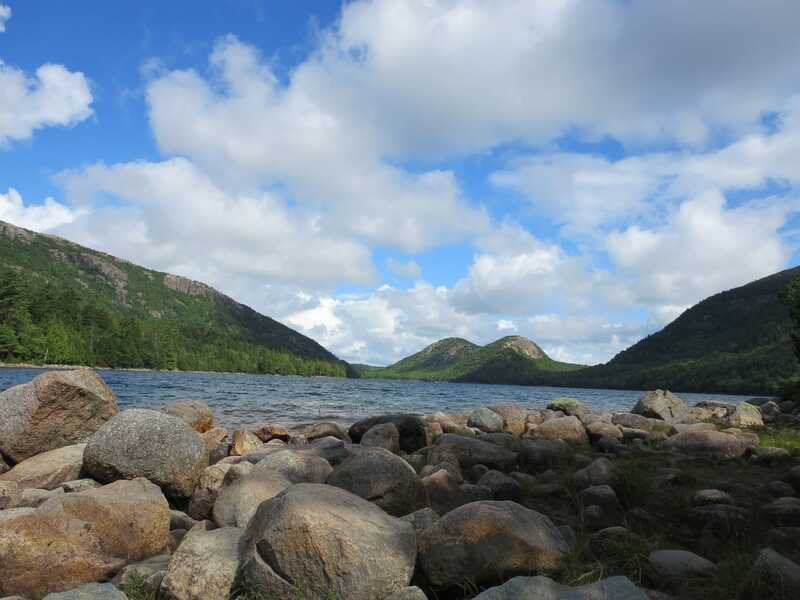 Note(1): There is a short spur trail at the northern end of Jordan Pond that goes up South Bubble Mountain. Tack on the additional mileage for some expansive views of the immediate area. 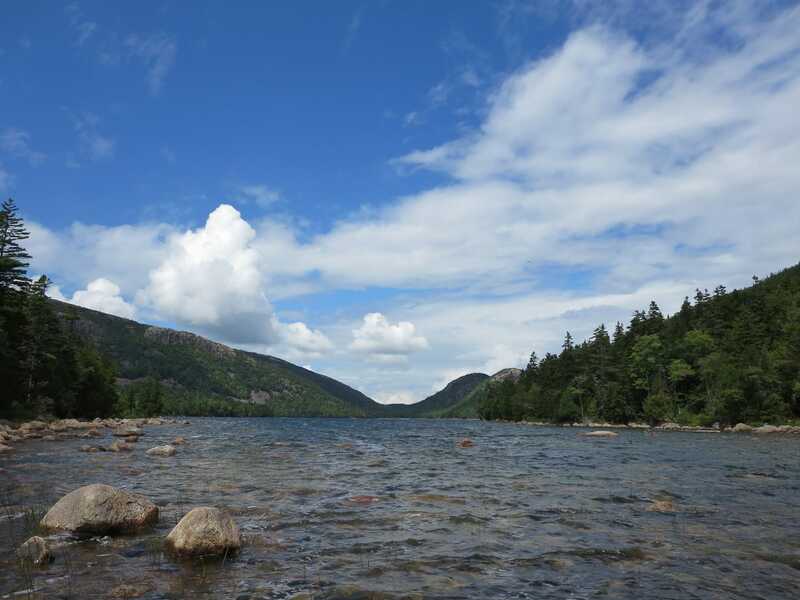 Note(2): Because Jordan Pond is a pubic water supply source, swimming is not permitted. Follow Park Loop Road for about 3 miles until it splits. Continue straight at the split and watch for the signs for the Jordan Pond North Lot parking on the right.